The upper part of the creek is home to the first warm water hatchery in the state. The Hot Creek Hatchery originally opened in 1941, but local clubs started raising trout at Hot Creek in 1928. Just below the hatchery there is an Interpretative Site, which allows public access to a small stretch of the creek. Public access then picks up again two-miles down stream, below Hot Creek Ranch. 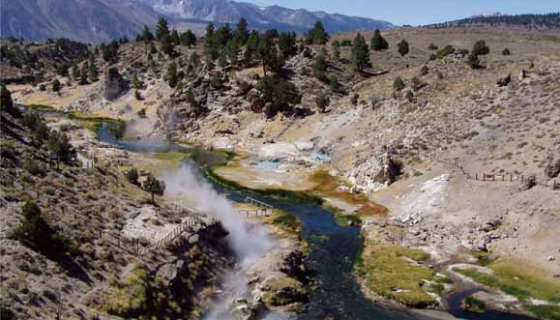 Despite offering a parking area and restrooms at the Hot Creek Geological Site, the U.S. Forest Service no longer allows people swim at Hot Creek because of inconsistencies in the water’s temperatures. Directions: From Highway 395 just south of Mammoth Lakes, take Hot Creek Hatchery Road past the airport. Just before the hatchery, take a right. There are several access points and parking areas along the dirt road. 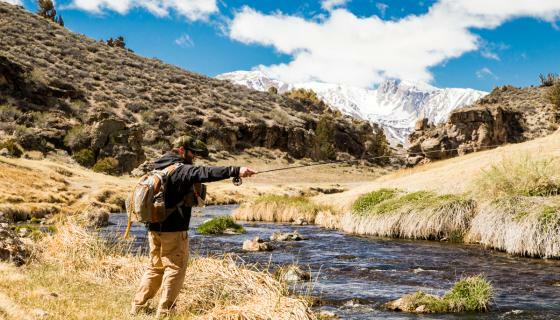 Hot Creek is the kind of place where even if you only catch one fish, you feel like a winner. The creek is small, shallow and open. It is easy for even a novice fly fisher to cast across the entire creek. It is also easy for the numerous fish stuffed into the creek to notice anglers long before the anglers notice them. And since the fishery gets lots of action from eager anglers, the trout certainly know what fishermen and artificial flies look like, especially the older brown trout, which often run in the 18-24” range. 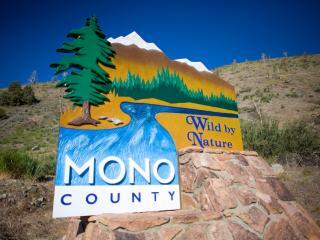 Hot Creek is one of only three year-round fisheries in Mono County. It is managed as a catch and release fishery, with only artificial barbless hooks allowed. It is a walk and wade fishery, although wading is not recommended at Hot Creek, as it not only damages the fishery’s habitat and can spread invasive aquatic species, it also unnecessary as the creek is exceptionally easy to fish from the bank. The challenge is to fool the fish.